Heading for Grand Banks | Summerside Port Corporation Inc.
SUMMERSIDE — Another crew of Islanders are heading away for work, but this time it’s to the east and on the waters of the Grand Banks off southern Newfoundland and Labrador. Crew member Steven MacPherson readies crew luggage for the White Diamond crab boat with captain David McIsaac as they prepare the boat at Holman’s Wharf for the trip to the Grand Banks off Newfoundland and Labrador. Captain David McIsaac, from Richmond, is taking the 65-foot White Diamond crab boat to the tail of the Grand Banks with five crewmembers and a monitor from the Department of Fisheries and Oceans. Crewmembers include McIsaac’s son, Daniel, Summerside residents Tyson Arsenault and William Gunning, Slemon Park resident Steven MacPherson, and Brian Boudreau from Cheticamp, Cape Breton. McIsaac has been making the trip to the 3NO region off southeastern Newfoundland for four years, after selling off a Gulf crab licence. “The P.E.I. quota was small, so it was either go big or retire, so I decided to go big,” he explained. It was hard to make a living on a 20,000-pound quota. The quota for the Grand Banks is 750,000 pounds. “Little bit of a difference, but when you see three fuel trucks pulling up to fuel you up, it takes a chunk out of it,” he added. Interestingly, the price of fuel in St. John’s, N.L., is lower now than P.E.I., thanks to the implementation of the HST, McIsaac notes. That, of course is only part of the cost of doing business while on three month tour. They also have groceries to purchase when they land their catch (about $800 per week), repairs, crew salaries, and other costs that may crop up, such as traps lost to competing draggers. “We lost 200 traps to Spanish draggers last year. There’s not a lot we can do; they are supposed to stay away from set gear but don’t seem to pay attention,” he says. DFO has advised him to keep track of such losses this year and they will see if there is anything they can do, but fishing in international waters, about 100 miles beyond the 200-mile Canadian zone, complicates the matter. The 148-tonne White Diamond, built in 2002 and purchased by McIsaac in 2012, is a little late starting out this year, because of ice, which was only cleared from the Canso Strait last weekend. The boat can handle ice up to about 16 inches thickness, due to its hull design. 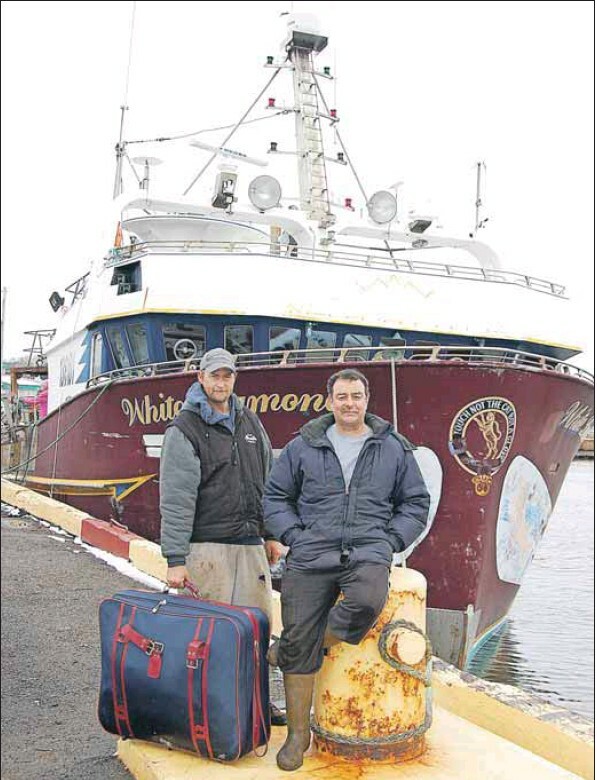 They expect to sail three and a half days to St. John’s, before sailing two days out to their fishing grounds, fish for three days, then sail back in to unload. The White Diamond will usually load 80,000 pounds of snow crab each trip, fishing 1,140 crab pots. At the first of the season, crab pots will likely contain about 100 pounds of crab each, which diminishes to about 35 to 40 pounds by the end of the season. McIsaac expects to have to complete about 11 trips to St. John’s to meet his quota. McIsaac is hoping for good prices this season, as Alaskan and Russian quotas in the Bering Strait zone, and Gulf zone quotas have been significantly reduced this year, based on DFO science. “When quotas are cut down, prices go up,” he postulated. Quotas for Nova Scotia and other fishers in the Newfoundland and Labrador zone have been adjusted — some slightly higher, others slightly lower – but remain unchanged overall. McIsaac has an increase of about five per cent this year. “Snow crab seems to be one that they pay a lot of attention to because it seems to be the big money one right now,” McIsaac identified. The DFO monitor checks the ratio of male to female crabs caught ( females are released), checks the weight of crabs, and measures crab sizes. McIsaac holds licences for the zone, fishing two and leasing one. The White Diamond only arrived at Holman’s wharf on Thursday, the crew spent Friday making repairs and provisioning, making sure details like scented soap were aboard, and were to set off Friday night. When the season ends, the crew splits to other jobs or fishing opportunities. McIsaac will captain a science vessel, up North, mainly tied to Parks Canada’s search for the sunken vessels Erebus and Terror — iron-plated, steam-engine ships lost with the Sir John Franklin expeditions after 1845 — but also serving science for the universities of Alberta and British Columbia whose researchers test water, sediments, soil, and ice samples. Last year, McIsaac spent about seven days at home between April and November. Together, the crew leaves about 16 family members to wait their returns. When he finally gets home, McIsaac will settle into repairing his crab pots and ropes. “There are two dump truck loads of rope that you have to go through, so it takes a while,” he quipped.